Stress is a factor in both horse and hoof health. Visits to the doctor for stress related problems are estimated to be between 75% -90%. The % of Veterinarian visits for conditions related to stress is probably very similar. The physiological changes that occur when a horse is stressed are the same as those triggered in the fight or flight reaction (physiological changes that heighten a horses chances of surviving a dangerous occurrence by increasing alertness, capacity for physical demands and the ability to withstand injury). This becomes a problem for domesticated horses if they are in stressful situations for long periods or on an ongoing basis; the fight or flight reaction does little to help them. The chain of events becomes destructive to both mental and physical health - hoof included. There are many ways to enrich the lifestyle of horses and turn around the effects of confinement. Freedom to move, interact with other horses and constant access to forage, water, vitamins and minerals, will all prevent negative physiological effects of regular or extended periods of stress. One consequences of stress is to use up energy - e.g.. producing new glucose, moving nutrients in and out of the blood stream - which could be used more efficiently elsewhere. Stress hormones are activated: cortisol, glucogen, norepinephrine and adrenaline. They reverse normal metabolic sequences to provide instant energy resources. Trapped in a cycle of using energy as a result of stress, fatigue can be just the beginning. Muscles contain large amounts of protein which are effected by catabolism - breakdown of proteins into amino acids - for energy when the (stress) chemical reaction is triggered. Bones are also compromised due to stress related issues effecting the bodies ability to store, release and use calcium. Instead of repairing damaged bones stress can aid in their disintegration. Significantly, remodeling of bone will be effected. (the chance to turn around navicular disease amongst other bone problems will be reduced). Hoof wall is made of keratinized horn, produced continuously at the coronary band. Keratin is a protein. Just as the protein rich muscles are effected, keratinisation of the epidermal cells within the hoof is effected. These epidermal cells also contain receptors for cortisol ! (a major stress hormone)!! 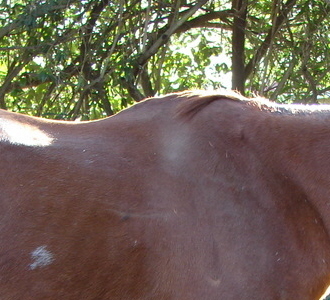 Irregular horn growth will result if stress effects the horse too often or for too long. It is an overlooked contributor to hoof pathology with many owners and professionals. Extreme high blood pressure - hypertension - results from long or repeated periods of stress. When stressed the veins constrict, blasting blood back to the heart which then blasts blood at increased pressure through arteries and finally into capillary beds. [The hoof is a mass of capillary beds, or venous plexus all reliant on cellular material brought by the blood. ] When this happens too often damage occurs at weak points in the body and hoof leading to inflammation. Arteries start to clog and prevent valuable nutrients and oxygen getting to tissues and organs. If unchecked, stress will contribute to hoof pathology - like laminitis - and potential recovery.